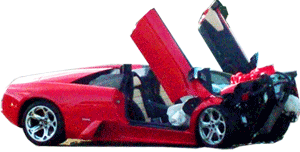 Lamborghini lost control at 7:00 AM while travelling at a very high rate of speed. The wheels ended up 50 meters down the road. 2009 Lamborghini Gallardo LP 560-4. Happened in Riyadh, Saudi Arabia.